Here are the best disco ball speakers that provide stunning LED lightshows with superb sound performance, and are perfect for parties and outdoor gatherings. These disco ball speakers come equipped with built-in LED lights that shine brightly and add a colorful flare to your room environment. They can literally transform your home into a disco party with superb sound quality and very stunning LED light shows. Furthermore, these speakers are designed to be portable so you can take them virtually anywhere, and have long-lasting built-in battery life for extended performance. If you are looking for a disco ball speaker for your next party, be sure to check out our top picks below! 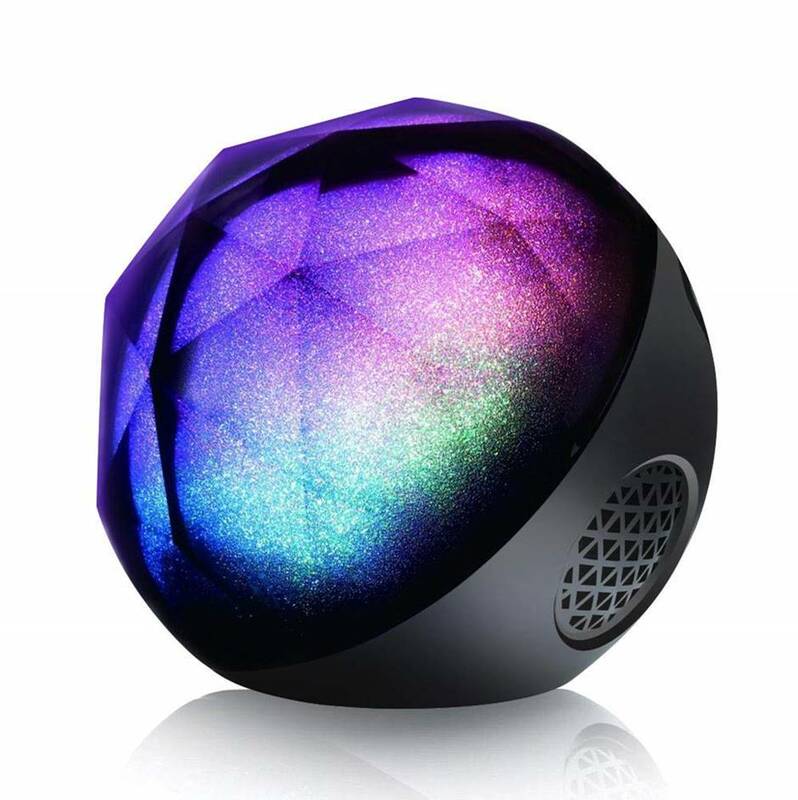 The Funkysky Disco ball speaker is a very stunning and attractive portable Bluetooth speaker with LED disco lights at the top. It comes with a built-in Bluetooth speaker that provides really good stereo sound and deep bass quality. The speaker has a 5W audio driver and passive subwoofer that provides crystal clear sound quality and good bass for rock and pop music genres. We particularly liked the disco ball lights at the top of the speaker – it has a 360 degree rotating disco ball light that is great for parties and gatherings – the multi-color lights project on the walls and ceilings and the lighting changings with the rhythm of the music, creating and instant party atmosphere. We were really impressed with how colorful and stunning the lights from these speakers turned out. 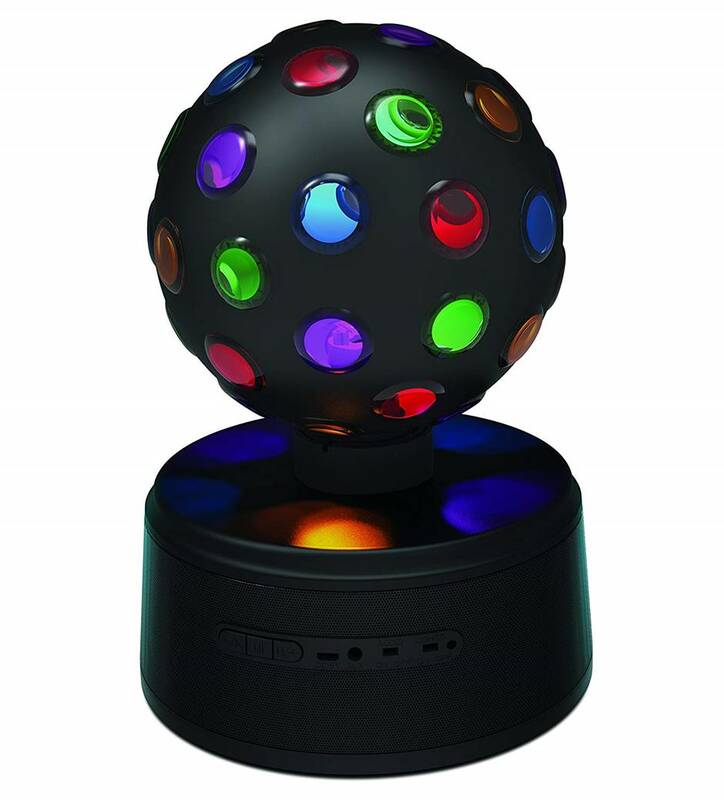 The Funkysky disco ball speaker features Bluetooth 4.1 which provides instant pairing and maintains a strong connection up to 66 feet. This allows you to connect virtually any Bluetooth enabled device. You can also play music from a USB flash drive, TF card or auxiliary line. These disco ball speakers allow you to play, pause and adjust volume and even answer phone calls on the go. The Funkysky speaker has a built-in li-ion 1200 mAh rechargeable battery that provides up to 4 hours of playtime, and recharges in 2 hours with the included micro USB cable. The speaker also comes with a micro USB cable for easy charging. Overall, it’s a fun disco ball speaker to have for parties and events and we highly recommend them. 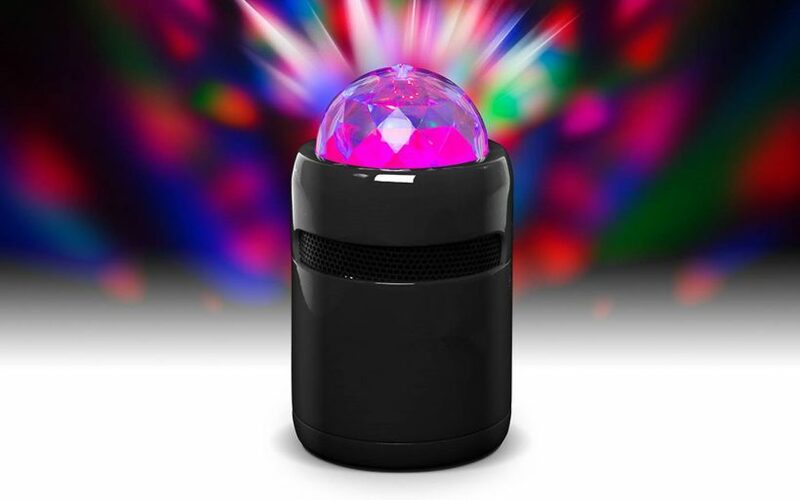 The VersionTech disco ball speaker is a stunning colorful LED speaker that provides a great combination of music and color atmosphere lightning with crisp sound. The speaker comes with built-in 6 color rainbow LED lights which enables 16 million colors to be disseminated. The intensity of the light and color will flash according to the rhythm and volume of your music. The speaker is great for indoor and outdoor parties and has hi-fi stereo sound speakers that deliver a wide audio spectrum. The high quality speaker provides strong bass without distortion even at the highest volume levels; they are great for rock and pop genres and sound very enjoyable to listen to. The VersionTech Bluetooth speaker is equipped with advanced Bluetooth 4.1 technology which is compatible with most Bluetooth-enabled devices, with a wireless range of 33 feet. It also supports TF card with mp3 format decoding functionality. The speaker is compatible with almost any Bluetooth device including smartphone, tablets and laptops. This disco ball speaker has a mini portable design with a dimension of 4.92 “x 4.92” x 4.53” and is easily to carry around. We also liked the fact that this speaker comes with a built-in 1200 mAh rechargeable battery that provides up to 8 hours of continuous music playtime Overall, the VersionTech is a versatile disco ball speaker that provides great sound and LED lights, and we highly recommend them. 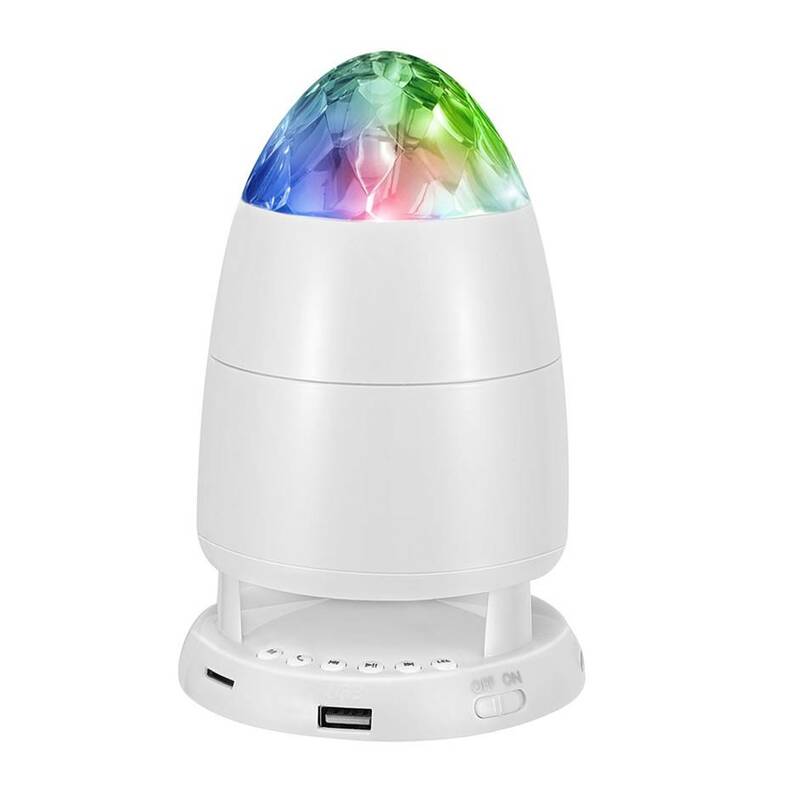 The OutGeek disco ball speaker is a very attractive speaker with RGB magic ball lights that deliver colorful and bright colors. The speaker can be used to create a party lighting effect, and also supports remote control and sound control – the lighting effect also changes according to the music. The OutGeek speaker comes with crystal stage lights and a small USB port which can play music by Bluetooth connection, depending on your preferences. The LED ball light creates dazzling patterns in your room and adds to the disco party feel. The disco party light has a total of 9 colors and syncs with your favorite music – you can also change the mode between automatic and manual operation. The OutGeek speaker delivers crystal clear sound quality, with crisp highs, detailed midranges and decent bass output. We liked the fact that you can crank up the volume to maximum on this speaker without hearing any distortion. The disco ball rotates clockwise and counter-clockwise, and shifts between red, green, purple, blue, white and orange colors. The entire speaker is relatively lightweight and can be carried around easily. If you are looking for a fuss-free disco ball speaker that performs well with very good sound effects, we highly recommend the OutGeek speaker. The ColorSage disco ball speaker is a very attractive and stunning speaker with a range of connectivity options, including USB and Bluetooth options. The disco ball lights have built-in 6 colors that provide a brilliant lighting effect with a dynamic changing combination of colorful lights. The Colorsage speaker has multi-function support with LED crystal strobe lights which support Bluetooth connection for audio transmission, including TF and USB audio files. The speaker also features two primary control modes – auto mode or sound mode – which programs the disco ball lights to flash according to the frequency of the sound. The higher the sound frequency, the faster the strobing lights will flash. The sound quality on this disco ball speaker is pretty good, with crystal clear vocals and tonal controls. The amount of volume it delivers is decent considering its small and compact size. This disco ball speaker is great for indoor and outdoor lighting, and has a powerful consumption between 3W to 9W. The entire speaker is designed to be lightweight and portable, so you can take it virtually anywhere without any issues. They are great for disco parties, parties and events where you can showcase this speaker to friends and family. 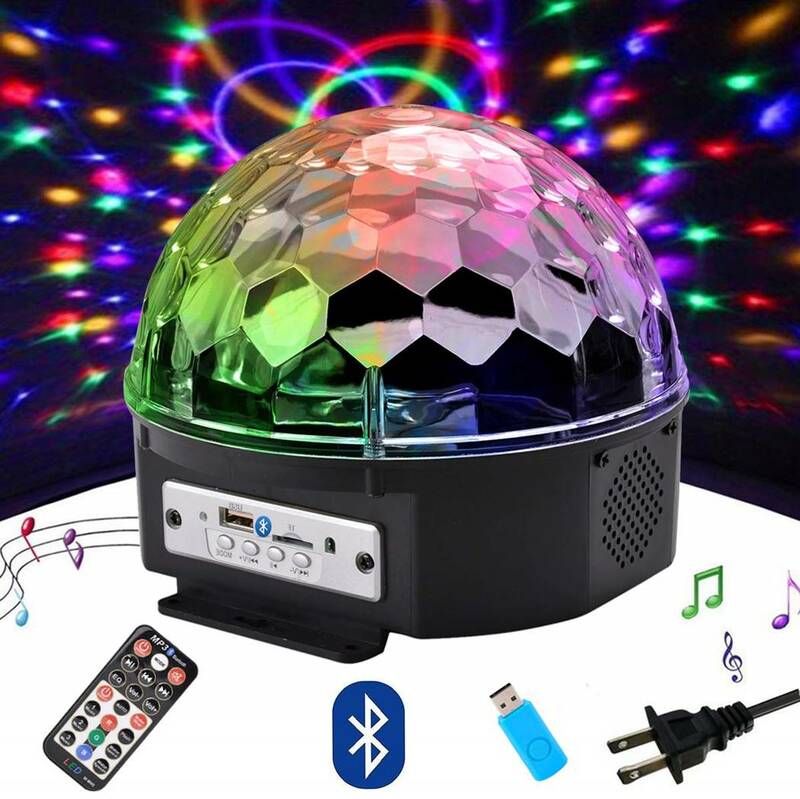 The entire package comes with the disco ball speaker, remote controller, user manual and USB cable for easy connectivity. The Sharper Image disco ball speaker is a well-designed and very unique speaker that is designed for parties and outdoor gatherings. Straight out of the box, this speaker looks stunning and can creative a festive atmosphere with bright colors and great sound quality. It comes with a rotating multi-colored disco ball that projects LED lights onto the walls and ceilings while your favorie music plays in the background. The 360-degree speaker base plays crystal clear audio from all directions, filing the room with quality audio performance and crystal clear sound. This disco ball speaker has a small footprint, allowing it to fit comfortably in any space where it can serve as a conversation starter. The speaker is very easy to operate and connects to your mobile device via Bluetooth connectivity. It also has an auxiliary input option for wired connections. 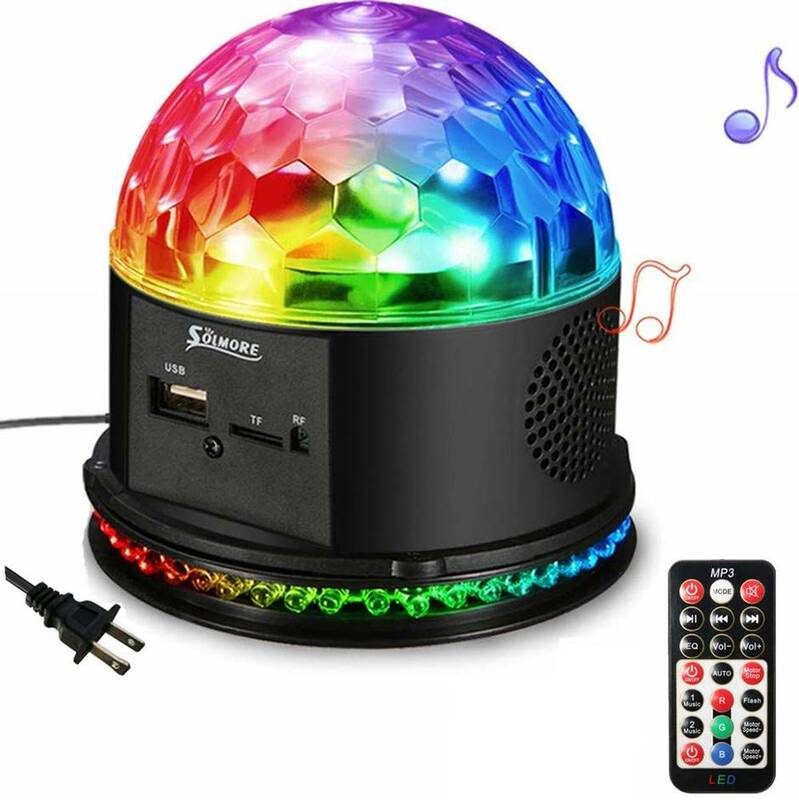 If you are looking for a disco ball speaker that can project clean LED lights with a dazzling display of colors, while enjoying crisp sound performance in the background, the Sharper Image disco ball speaker is a great choice. The sound performance from this speaker is decent, with nice highs, good midtones and decent bass response. It has enough volume to fill up a medium room without any distortion, and is a great speaker for disco parties. 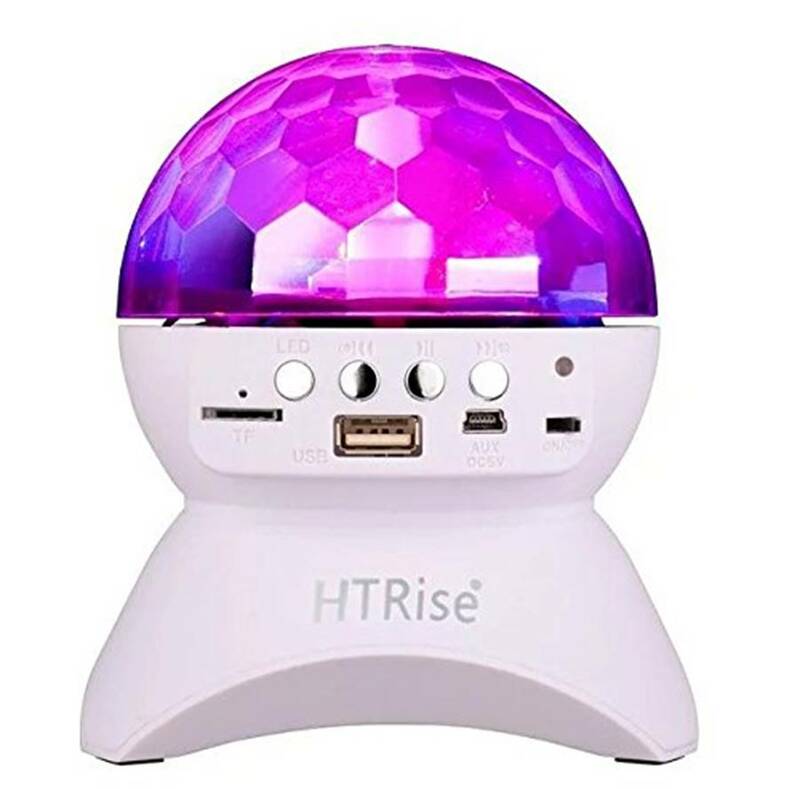 The HT Rise disco ball speaker is a portable Bluetooth disco ball speaker that delivers stunning RGB LED lights and crisp sound performance. The speaker has a disco ball light at the top that rotates and spins, creating a dazzling lightshow in the entire room. The HT Rise speaker features RGB LED magic stage rotating lights that changes according to your music volume and speed. The sound performance of the HT Rise speaker is crystal clear, with very good highs, clear midtones and decent bass performance – you can play rock and pop music genres through this speaker without any distortion. 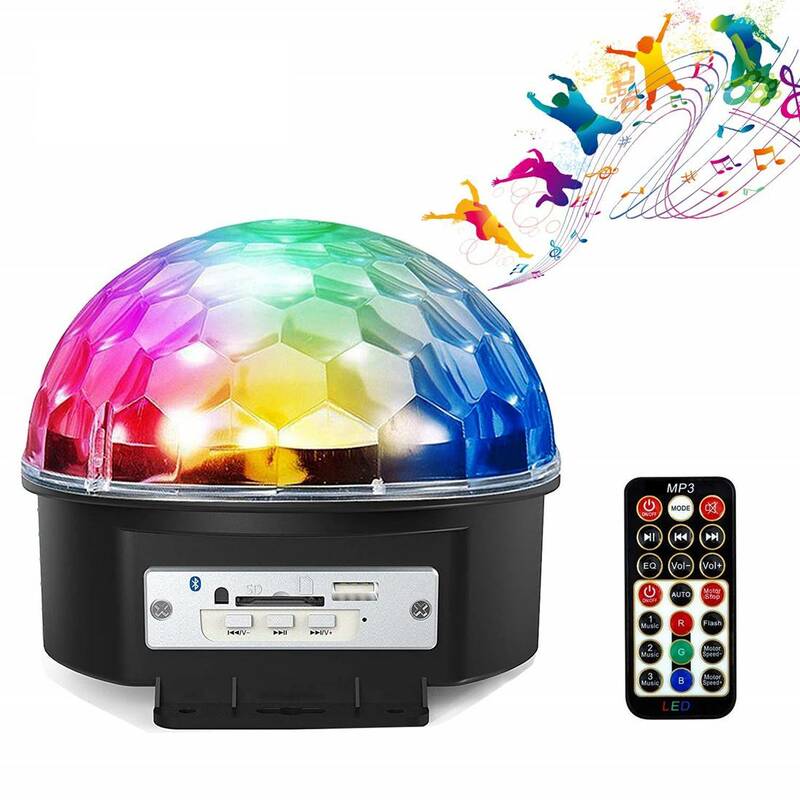 The Bluetooth disco ball party light speaker features version 2.1 and EDR wireless Bluetooth connectivity that connects to almost any Bluetooth smartphone device. It also comes with a built-in chargeable lithium battery that provides 3-5 hours of continuous playtime on a single charge. The speaker is perfect for small parties, disco parties and gatherings and is a great gift for friends. The SOLMORE disco ball speaker is a Bluetooth speaker with a rotating disco ball that delivers stunning LED lightshows for parties and outdoor gatherings. This speaker supports USB stick and TF card memory readers, as well as wireless Bluetooth connectivity. It also comes with a wireless remote control that allows you to control the speaker from a distance away. You can also switch between a variety of LED light modes using the remote control to switch the lighting modes. The SOLMORE speaker supports auto, flash and flashing lights activated modes and you can also control the speaker to display a specific color according to your mood and theme of the party. The sound quality on the SOLMORE speaker is crisp and crystal clear, and we could crank up the volume on the speaker without hearing any distortion. The SOLMORE speaker has a very sleek and stunning design. It is easy to install and is essentially plug and play – you can place it on your desk, wall or ceiling. The stage light adopts high-quality super bright LEDs with low power consumption. The bright LED lights on this speaker are stunning with 48 LED combinations (16 red, 16 green and 16 blue). The entire speaker is relatively compact and uses an AC power supply to power the speaker. 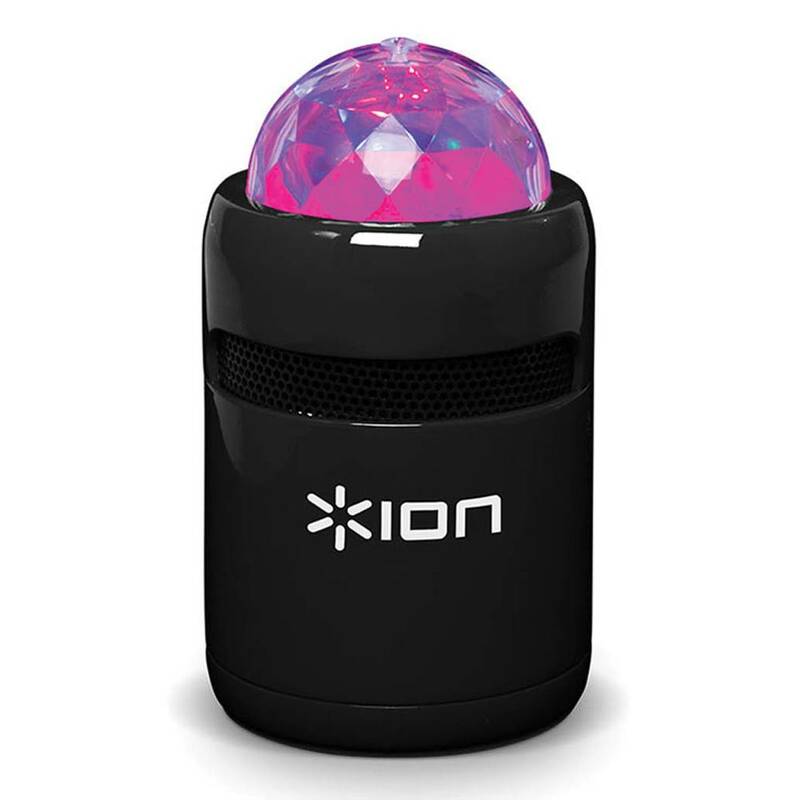 The ION Audio disco ball speaker is a powerful speaker you can find on a budget with colorful LED lights. This speaker has a bright disco ball at the top with projects pulsating multi-colored party lights onto walls and ceilings, and adds a tremendous party vibe to parties and gatherings. 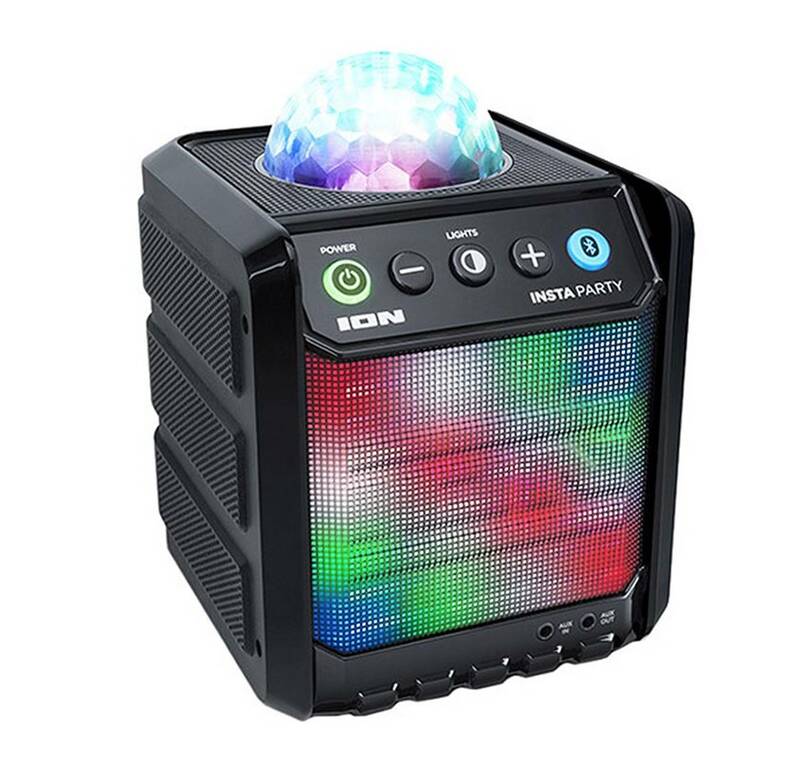 The ION Audio Party speaker works with iPad, iPhone and iPod devices which packs a good punch with a multi-colored light show. It also comes with convenient buttons on the speaker to skip, pause and play tracks for convenient operation. You can also answer phone calls with built-in microphone which is a nice added touch. The ION Audio disco ball speaker is compact and provides full-range sound with a bass radiator that delivers rich sound performance. It has a battery life of up to 10 hours and a battery recharge time of 1.5 hours, with a 500 mAh ion battery that charges via micro USB cable. The speaker takes approximately 1.5 hours to reach a full charge when connected to the AC adapter. The speaker has a 3W wattage and a wireless Bluetooth range of up to 30 feet. The speaker has a compact and portable dimension of 2.6” x 2.6” x 4.4”. The entire package comes with the ION Audio party speaker, USB charging cable and quick-start guide for easy reference. 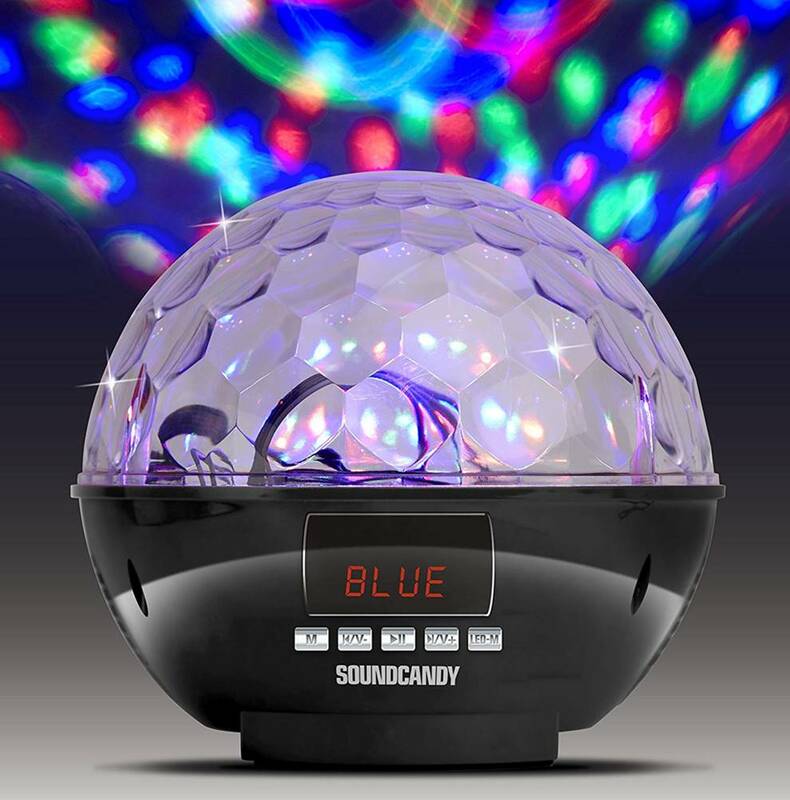 The SoundCandy is one of the best disco ball speakers with really good sound quality and colorful LED lights. The SoundCandy features dazzling and brilliant lights powered by LiveLights technology with 4 different light modes and different rotating lighting effects and colors. This Bluetooth lightshow speaker comes with a special built-in rotation motor that gives a spinning effect like a real disco ball. The LED lights are powerful enough to completely fill a 2000 square foot room with lighting effects. You can play your favorite music stored on a USB drive or micro SD card on the built-in mp3 player. There is also an auxiliary cable that will allow you to plug in your smartphone, radio or any device with a headphone jack. The sound quality on the SoundCandy is pretty good, with crystal clear vocals, crisp highs and punchy bass performance. Rock and electronic dance music genres sounded very enjoyable to listen to with this speaker, and the dazzling LED lights changes according to the beat of the music. We liked the fact that there are 4 different light modes with different rotating lighting effects and colors – there is also an FM radio and digital LCD display to see the radio stations. This speaker provides up to 5 hours of continuous music playtime and recharges quickly when plugged into the USB port. If you are looking for a disco ball speaker with brilliant light performance, the SoundCandy Bluetooth speaker is a great choice. The ION ISP86 is one of the best disco ball speakers that provides loud volume output and crystal clear audio performance. It comes with a multi-color light dome that fills the room with beautiful effects and has a grille that is completely illuminated in dazzling LED lights. The ION speaker comes with a powerful speaker that delivers vibrant sound performance without any distortion at maximum volume levels. The sound performance from this speaker is full-range and handles a wide variety of music genres including rock, pop and electronic dance music. The entire speaker also comes with a rechargeable battery with micro USB charging cable included. The wireless Bluetooth connectivity allows you to stream music wirelessly from any Bluetooth device directly to the ION speaker without any issues. We liked the fact that the ION ISP86 speaker comes with easy control buttons with play/pause and volume buttons on the top of the speaker. It also features a 3.5mm auxiliary input for non-Bluetooth devices, and also comes with a UBS powered and micro USB charging cable. The speaker lights and grille are stunning to look at and the multi-color light dome project colorful lights around the room. It’s a very well built speaker that has a durable construction and we highly recommend them.